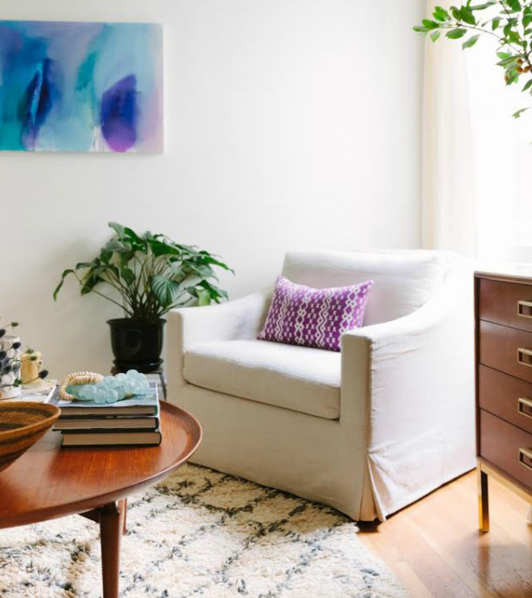 If you love the look of a clean, modern neutral palette mixed with subtle pops of color and texture then look no further then Decorist Elite Designer Heidi Caillier's own home makeover. For her project, Heidi used crisp white walls and slip covered furniture as the jumping off point. She mixed in different textures and materials as well as vintage and mid-century pieces to help give depth and interest to her rooms. 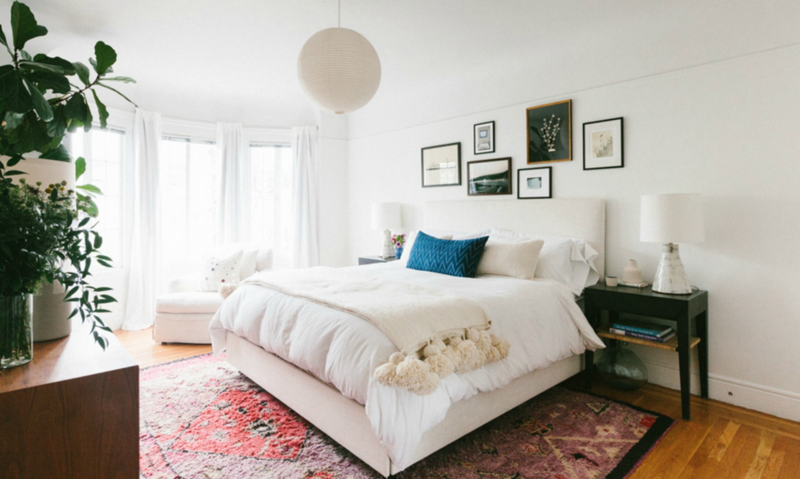 Her goal was to create a comfortable and livable space that had a curated, collected-over-time look. She incorporated interesting art and accessories that she picked up over her own travel adventures to help give her home a unique, cozy feel. Today, we asked Heidi to take over the blog to share her tips on how to bring color and interest to a neutral space. If you want to read more about her project, pop over to . Use more neutral tones on your larger pieces - sofas, beds, rugs - and layer in wood tones with your case goods. This creates a beautiful base to add more color to. Smaller pieces like art and pillows can really round out the mood of a space. They are also easy to switch out as your tastes change. It creates a more dynamic space. Nothing too match-y. Bring in a nice mix of prints, ethnic patterns, solids and textures to create visual stimulation and keep it interesting. Adding one small pop of color with a vase, or a lamp, does wonders to elevate a room. It can become a major focal point while allowing the eye to relax a bit with the rest of the room. The simple act of bringing in plants instantly adds color and texture to any room. Trees help to bring the color up above eye level to add another dimension, while a bunch of leafy greens on a coffee table or book shelf can round out a styling moment like nothing else.